Like many Homelabbers on a residential connection, I only have a single public IP to work with, and with this comes the challenge of hosting several services behind this single IP. While on my internal network I have several VMs (internal wiki, Plex, Gitlab, website, etc.) accessible to my LAN, by conventional hosting methods I could only make one of these available through my public IP at a time. In comes reverse proxying, where you expose a single server to the external network (public IP), and it will then redirect that traffic to where it needs to be depending on the desired host. For example, someone on the internet may request blog.acabey.xyz, the request will reach my proxy server, then based on the desired host (blog.acabey.xyz), the server will pull internally from my blog host (blog.eden.localdomain on my internal domain) and feed that content right back out to the internet client. Cool stuff! While there are a ton of tutorials on how to configure a reverse proxy with nginx, I fancy myself an apache man and took it to use my webserver of choice instead. You can use reverse proxying to host multiple services, redirect ports, and whole bunch of other magic. 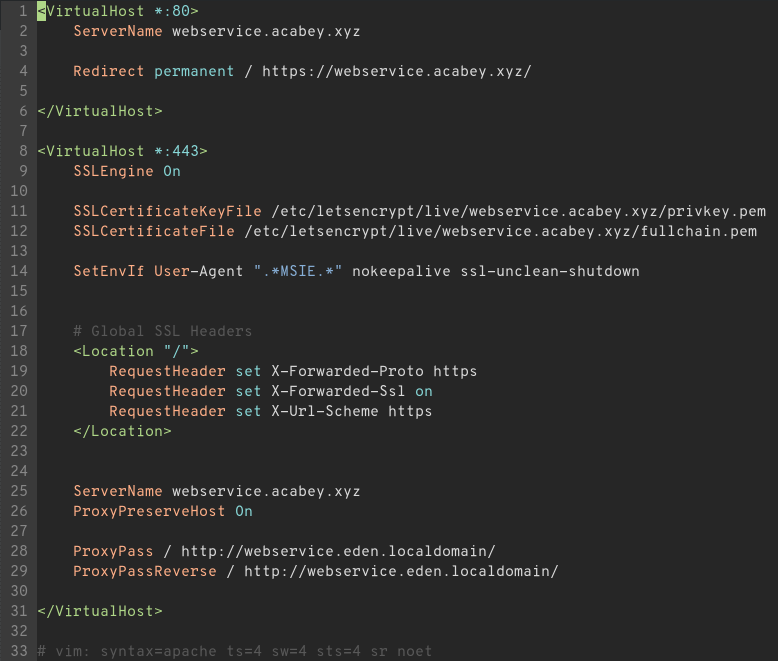 I will cover setting up a basic web service behind a proxy and enabling SSL with LetsEncrypt. In order to reach your service through your domain/subdomain, set up an A record pointing towards your public IP. This is entirely dependent on your DNS service, so I’ll leave this as an exercise to the reader. The first step on your end is to forward your incoming web traffic to your reverseproxy server. Again, this step is entirely dependent on your network / firewall configuration, but should be simple enough. When you are done, you should see the apache landing page (being served by your reverse proxy server) when you access any of your domains. Ideally, you should set up an internal, self-signed CA that you add to all the machines on your internal network, and use a certificate signed by this CA on your internal webserver. From there, the only things you have to change are the ProxyPass directives in your virtualhost to https rather than http. To really step up your security game, we will use LetsEncrypt to establish SSL with our internet users. In the interactive window, be sure to Allow both HTTP and HTTPS connections, we will fix this in a second. Go back into your apache site config and notice that you should now have a virtualhost listening on port 443.